Where one song showcases guitarist Mike Sullivan, drummer Dave Turncrantz and bassist/keyboardist Brian Cook's mastery of lush melancholic melody, the next exhibits their most abrasive underground metal leaning sound, with washed-out 16th-note riffs and crushing rhythms. The band's penchant for endless hooks remains a constant, but Memorial embodies their most dramatic ranges in tone. "We've always tried to balance our metal-influenced sounds with more nuanced, pretty, orchestral elements," Cook says. "But this time, it's far more polarized in that the heavy parts are much more blown out and exaggerated while the pretty moments are far more restrained, delicate, and atmospheric." 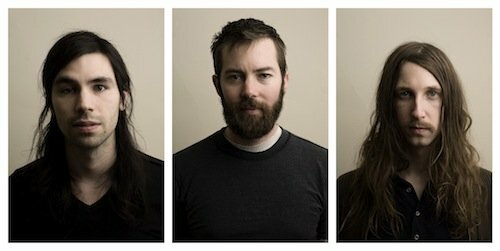 In the two years since Russian Circles released their landmark fourth album Empros, the Chicago trio toured worldwide nearly incessantly, encountering many heavy acts whose music seemed needlessly complicated. "We set out to make a straightforward, intense, heavy record," Cook explains. "We subconsciously gravitated toward darker and more somber sounds. We wanted to get away from the overtly flashy." In search of such a streamlined sound, the trio focused on each individual song having its own emotional and musical characteristics. As such, Memorial almost feels like stages of grief. That notion might be aided by 1) the album's clever structuring, in which it ends in the same place as it starts, and 2) special guest vocalist Chelsea Wolfe lending her hauntingly somber vocals to the album closing title track. To a degree, the monolithic, juxtaposed moods on Memorial is the band's reaction to the proliferation of iPod culture affecting how bands write music. Today, most musicians are trying to mash together disparate elements with results sounding as unpalatable as cooking a meal blindfolded. Russian Circles wisely and deftly sidestep the trappings of genre amalgamation. "I want to hear a band with a broad palette," Cook says. "But it should find that weird balance with breadth and width. We wanted to make a record with more extreme peaks and valleys. I'm hoping that we can get away with making a schizophrenic record." Those extremes are no more perfectly exemplified than on album opener "Memoriam", which leads in with delicately plucked guitar notes and synth haze hovering in the background, vaguely reminiscent of Pink Floyd's Wish You Were Here album. But the mood abruptly ruptures as the next song, "Deficit" forcefully kicks in with a wall of vicious, treble-bleached guitars blaring over Turncrantz's half-time rhythm pummeling his drums with the sound of an industrial machine re-fabricating raw materials. Tension builds to a breaking point about halfway through, opening into a skull-thwacking chugging riff that becomes the foundation for multiple mutant variations slithering over the top. "1777" is possibly Russian Circles' most epic and perfectly streamlined song of all time, incorporating both the physical dynamics of the studio in its sound -- much like David Bowie's emotive vocals on "Heroes", but instead with drum beats and guitars jutting outward in dramatic fashion -- while also developing a slow-burn build of elements purely focused on the emotional specificity of the song. Elsewhere, the uplifting melody of "Ethel" features a chiming finger-tapping guitar line that's heavily treated with effects making it sound like a vintage synth laid over powerfully expressive drums and distorted bass notes cascading over the proceedings with the forceful cadence of a lead vocalist. Album closing title track, "Memorial" is a plaintive, somber ballad featuring Wolfe's guest vocals. A hazy version of the album opening guitar notes hang in the distance as Wolfe's reverb-soaked voice hovers above the dreamlike melody somewhat reminiscent of Julee Cruise's Twin Peaks theme song. Memorial was recorded at the illustrious Electrical Audio studio in Chicago with the band's longtime producer Brandon Curtis of The Secret Machines & Interpol who also helmed the band's two previous albums, Empros and Geneva. Memorial will be available on LP, CD and download via Sargent House on October 29th, 2013.